Accenture Navitaire’s Jam for Hungry Minds 2012 is a fundraising competition that was organized by the employees of Accenture/Navitaire in the Philippines. This activity aims to raise funds for the benefit of the students of Food for Hungry Minds School. Last November 29, 2012, participating bands was formally introduced and performed to all the employees of Accenture/Navitaire. Audience were encourage to vote, not only to support their favorite band but to also raise for the students of Hungry Minds. 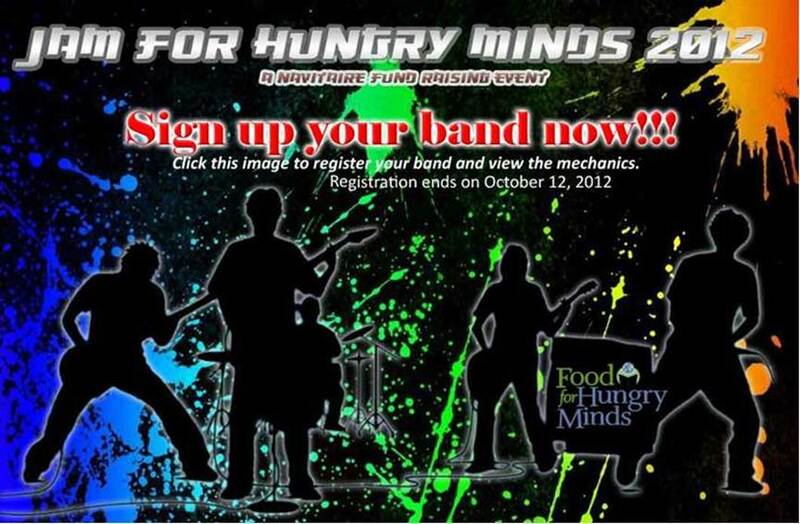 Winner of the JAM for Hungry Minds will be announced during Accenture/Navitaire Year-End Party. Voting will be until December 11, 2012 only. So please cast your votes now! Let’s help make this another successful event. 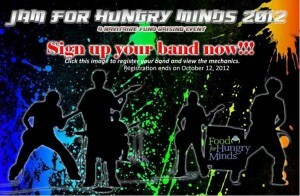 For more info, please visit the JAM for Hungry Minds 2012 YouTube page. Check out the playlist of great music videos created by the participating groups from Navitaire and SUS – The Saboteurs, The Res Band, Forever Wassaque, Remedy Sus Manila, and JNG Project.